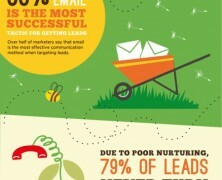 Home »Posts Tagged "Lead Nurturing"
Lead nurturing and generation could resemble with cultivating your back yard. Think it. Marketmakers suggest 8 practices that can make your efforts of the most fruitfull. Say it with a story and you’ll steal the spotlight. People from Look Book HQ highlight the importance of storytelling to B2B marketing as the most effective practice for standing out from the crowd captivate your prospects’ interest. According to recent research on giveaway contests’ effectiveness, conducted by IncentiVibe, crafting a well built contest landing page can bring in up to 700% increase in lead generation and amplify 5x the social media engagement. Read the facts. B2B marketers should consider the great opportunities that are emerging due to the striking growth of social media. Tailoring a smart social media marketing strategy is the key to lead nurturing and further to customer acquisition and retention. From shadowy and costly traditional marketing to focused and efficient inbound marketing. Which are the 5 keynotes that will bring you to the right path for business growth?